This is the first double-sided DVD I've encountered - the movie and all of its supplementary material on one disc. Wonderful! 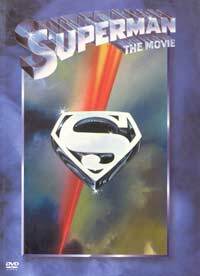 When the advanced planet Krypton is destroyed, a sole survivor is sent to earth. He grows up to become Superman. Mild mannered reported Clark Kent by day, but transforming into Superman when trouble looms, fighting for justice in Metropolis. Criminal mastermind Lex Luthor has a few tricks up his sleeve, though. Besides the amazingly executed first live action version of this timeless comic book character, the DVD contains documentaries and interviews with director & characters, shedding eye opening light on the effort put into the project. For those truly interested in facts like that, Richard Donner (who went on to direct the Lethal Weapon movies and also did The Omen) contributes an enlightening commentary track. A varied casting audition tape as well as a look at the CGI-free, but still fantastic FX, are included. The innovation and effort to create some of the scenes are unbelievable. This is a superb package for a groundbreaking movie.